When Joey Logano first came on the racing scene that was my old newspaper beat, he was a pint-sized racer with a papa who had deep enough pockets to buy him the best of everything. Little Joey had the best equipment, but he also had a natural knack for knowing what to do with it. He won early and often in Legends racing, sometimes racing with paperwork “verifying” his age that was, to say the least, creative. His string of 14 straight Legends wins still stands as the track record. 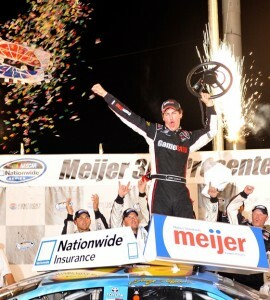 Even as Logano progressed into Late Models, he was a kid in a man’s world, even though he won more often than he lost. When he made his first Late Model start at Senoia Raceway, he was 13 years old, about 5 feet tall and weighed about 90 pounds. He hit the outside wall and broke his arm, but his driving skills didn’t go unnoticed by the veteran short trackers in the field that night. Among those who were boldly predicting big things for little Joey was Ronnie Sanders, a legend on the short tracks of the Southeast who is now retired and a member of the Georgia Automobile Racing Hall of Fame. As Logano made the climb up to the Sprint Cup Series, he still came across, in many ways, as a kid in a man’s world. 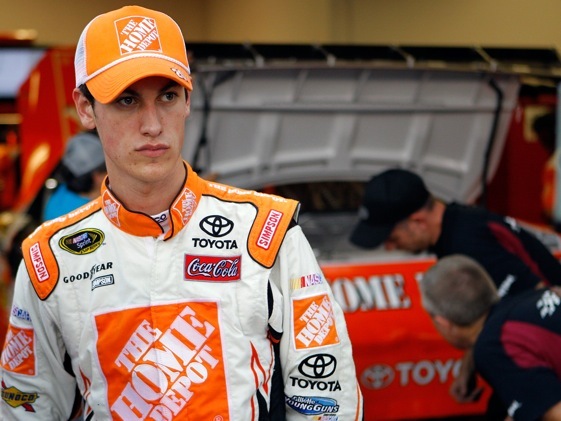 His dad, Tom Logano, seemed to be everywhere, sometimes getting into conflicts on his son’s behalf. But the Joey Logano who showed up for a behind-the-hauler interview at Daytona International Speedway last month, was clearly much more mature. He seemed relaxed. He sounded confident in his answers, and he was talking like an adult. For starters, he informed the assembled gaggle of reporters that he’d moved out of his parent’s home into a place of his own. He and fellow racer Coleman Pressley, the son of former Cup driver Robert Pressley, are now living the bachelor life in a house in Huntersville, N.C. He said he’s got a bed now, a TV, and some other furniture, and he’s spending a lot of his time – and money – with his Cup sponsor, The Home Depot, as he paints, patches and improves things around the house. Logano also appears to feel much more at home when he’s at work. He said the orange-and-white No. 20 Toyota finally feels like it belongs to him instead of feeling like a loaner from the previous occupant, Tony Stewart. “I think it took me a year and a half to feel that way,” he said. Last fall, Logano began posting the kind of results people were expecting when they hung the “Sliced Bread” label on him. In the final 11 races of 2010, he had seven finishes of seventh or better. “We started really understanding each other and what kind of makes each other go,” he said of his relationship with his team’s pit boss, Greg Zipadelli. Logano’s also figured out what many a young racer comes to know – that in many ways it’s easier to race up front than back in the pack. And when you prove you belong among the elite, the on-track relationships with your fellow drivers tends to change. And, like a smart racer, Logano appears to have put his high-profile confrontations with fellow drivers like Kevin Harvick in perspective, and in his rear-view mirror. “I don’t think you can talk to one race car driver in this whole garage that says he’s never been in some kind of scuffle with anybody,” he said. “I think they’d be lying if they said that. That’s part of it. He sure crashed alot this past weekend. I guess Home Depot can afford it.